Ron (John David Washington) and Patrice (Laura Harrier) strike power poses in Spike Lee's BlacKkKlansman. Looking through a newspaper at his desk one morning, Stallworth (John David Washington, sporting an impressive Afro the real Stallworth didn't have at the time) sees a Ku Klux Klan recruitment ad with a phone number. He calls it, one thing leads to another, and soon he finds himself talking with David Duke — yes, that David Duke — the Klan's chatty, gregarious Grand Wizard, as played by Topher Grace. When asked why he's calling, Stallworth launches into a racist riff: "I hate blacks. I hate Jews, Mexicans and Irish." Every head in the precinct has now turned to watch him. "...and anyone else really who doesn't have pure white Aryan blood running through their veins." This earns him an "I'm happy to be talking to a true white American" from Duke and, before he hangs up, an invitation to the next meeting of the Klan's Colorado Springs chapter. As Ron hangs up, and the camera lingers on the astonished faces of the white policemen sitting around him, the director gets the laugh he's looking for. Not the first, and certainly not the last, since Stallworth now has an obvious problem. He needs a white police officer to play him. "With the right white man," he says, "you can do anything." The right white man turns out to be Flip Zimmerman (Adam Driver), who attends the Klan meeting, tries to get the lay of the land, and attracts a little too much attention in the process. "You ask too many questions" says a beady-eyed white supremacist. "You undercover or something?" Now, obviously, this is not a terribly comic question. There's serious tension in BlackkKlansman's situation, and the film embraces the shifts in mood with shifts in filmmaking style that allow Lee to couch his arguments in a kind of shorthand history of Hollywood's treatment of race. He includes scenes from Gone with the Wind and Birth of a Nation, has characters discuss '70s blaxploitation films, and gives his hero a bit of Shaft's swagger. And in grander scenes — an early-in-the-film Stokely Carmichael "Power to the people" speech to which Stallworth is sent undercover, say — the director shifts gears entirely, to deliver a cathartic broadside about Black Power. A gentler sort of power is also evoked in this very speech, when the civil rights activist talks of having been taught to internalize white standards of beauty, and the screen fills with Lee's quietly devastating response: closeups of the young black faces looking up at him, halos of soft light caressing cheekbones. Identity is central to BlackkKlansman, and not just black identity. Flip Zimmerman, Ron's partner in the police ruse, initially thinks his own (Jewish) identity isn't a factor — "for you it's a crusade, for me it's a job" he tells Ron. But when that aforementioned beady-eyed white supremacist demands Flip take a "Jew lie-detector test," he finally realizes he's got skin in the game. Lee's point, of course, is that we've all got skin in this game. He may depict '70s Klan members as bozos with hood-fetishes — hateful, yes, but amusingly incompetent. He does that, though, to soften us up for some harrowing juxtapositions, chief among them Stallworth's Klan-induction, inter-cut with an excruciating recounting of a 1930s Klan lynching to a rapt group of young people by an elderly survivor played by singer/activist Harry Belafonte. Lee uses that look-back to set up a head-spinning flash-forward to the Trump era that makes clear there's a reason BLlackkKlansman is opening this weekend, one year, nearly to the day, after the white nationalist rally in Charlottesville. If hate groups were insidious four decades ago, argues Lee in his most ferociously entertaining (and just plain ferocious) film in years, how much more dangerous are they today? Spike Lee's new movie "BlacKkKlansman" is, believe it or not, based on a true story. It's about an African-American police officer who in the 1970s went undercover to infiltrate the Ku Klux Klan by joining it. Critic Bob Mondello says the film is both funny and pointed. BOB MONDELLO, BYLINE: Colorado Springs is about to hire a new police officer. His name - Ron Stallworth. ISIAH WHITLOCK JR.: (As Mr. Turrentine) There's never been a black cop in this city. We think you might be the man to open things up around here. MONDELLO: Open things up he does. Looking through a newspaper at his desk, he sees a Ku Klux Klan recruitment ad. There's a phone number, so he calls it. JOHN DAVID WASHINGTON: (As Ron Stallworth) This is Ron Stallworth calling. Who am I speaking with? WASHINGTON: (As Ron Stallworth) Grand wizard of the Ku Klux Klan - that David Duke? WASHINGTON: (As Ron Stallworth) Well, since you asked, I hate blacks. I hate Jews, Mexicans and Irish. MONDELLO: Every head in the precinct has now turned to watch Ron. WASHINGTON: (As Ron Stallworth) But my mouth to God's ears, I really hate those black rats and anyone else really that doesn't have pure white Aryan blood running through their veins. MONDELLO: As the camera lingers on the faces of the white policemen, director Spike Lee gets the laugh he's looking for - not the first and certainly not the last since Stallworth, played by John David Washington, is quickly invited to a meeting of the Klan's local chapter, which presents an obvious problem. WASHINGTON: (As Ron Stallworth) We need a white officer to play me when they meet face to face. ROBERT JOHN BURKE: (As Chief Bridges) Can you do that? WASHINGTON: (As Ron Stallworth) With the right white man you can do anything. JASPER PAAKKONEN: (As Felix Kendrickson) Are you for the white race, friend? ADAM DRIVER: (As Flip Zimmerman) Oh, hell, yeah. DRIVER: (As Flip Zimmerman) What kind of stuff do you guys do? UNIDENTIFIED ACTOR: (As character) Cross burnings, marches. MONDELLO: ...Attracting attention in the process. PAAKKONEN: (As Felix Kendrickson) You ask too many questions. Are you undercover or something? COREY HAWKINS: (As Stokely Carmichael) We must unite and organize to fight racism. UNIDENTIFIED ACTORS: (As characters) All power. MONDELLO: ...Other times to evoke a gentler sort of power, as when in this very speech civil rights activist Stokely Carmichael talks of internalizing white standards of beauty and the screen fills with Lee's quietly devastating response - close-ups of the young black faces looking up at Carmichael, halos of soft light caressing cheekbones. 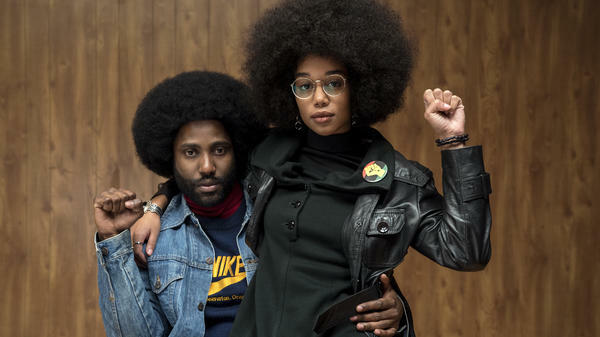 Identity is central to "BlacKkKlansman," and not just black identity. Flip Zimmerman, Ron's partner in the police ruse, initially thinks his identity isn't a factor. DRIVER: (As Flip Zimmerman) For you it's a crusade. For me it's a job. MONDELLO: But being Jewish, he has a reckoning of sorts. PAAKKONEN: (As Felix Kendrickson) You're taking this Jew lie detector test. WASHINGTON: (As Ron Stallworth) They hate you. Doesn't that piss you off? Why are you acting like you ain't got skin in the game? MONDELLO: Lee's point of course is that we've all got skin in this game. He may depict '70s Klan members as bozos with hood fetishes - hateful, yes, but amusingly incompetent. He does that, though, to soften us up for some harrowing juxtapositions, chief among them Stallworth's Klan induction intercut with an excruciating recounting of a Klan lynching. Lee uses that look back to setup a head-spinning flash forward to the Trump era. There's a reason "BlacKkKlansman" is opening this weekend, one year nearly to the day after the white nationalist rally in Charlottesville. If hate groups were insidious four decades ago, argues Lee in his most ferociously entertaining and just plain ferocious film in years, how much more dangerous are they today? I'm Bob Mondello. THE TEMPTATIONS: (Singing) Segregation, determination, demonstration, integration, aggravation, humiliation, obligation to my nation. Ball of confusion. Transcript provided by NPR, Copyright NPR.